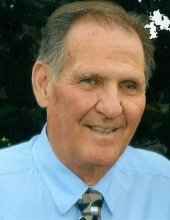 James "Jim" Brumback, 76, of Palmyra, MO passed away at 1:42 AM Thursday, February 7, 2019, at Blessing Hospital in Quincy, IL. Funeral Services will be at 10:00 AM Thursday, February 14, 2019, at the Mission Hill Baptist Church in Palmyra, MO. Pastor Kent Lewis will officiate. Burial will be at Masonic Cemetery in Ewing, MO. Family and friends are invited to Jim's Life Celebration at a visitation that will be held Wednesday, February 13, 2019 from 4:00 PM to 7:00 PM at Mission Hill Baptist Church in Palmyra, MO. Jim was born February 11, 1942, in Quincy, IL to Emanuel Sherman and Osie Jane Waterman Brumback. He was married to Sharon Hudson on August 4, 1961 at the Ewing Baptist Church in Ewing, MO. She survives. Other survivors include, his two daughters, Lisa Walker(Gregg) of Cedar Rapids, IA and Teresa Butler(Mark) of Palmyra, MO, three grandchildren, Kristen Sabin (Austin), Brooke Butler (her fiancé Nathan Miller), and Brock Butler, and one great granddaughter by marriage, Logyn Miller. Also surviving are cousins and numerous extended family. Jim was preceded in death by his parents. Jim graduated from Ewing High School in 1960. For most of Jim's life he was happily employed as a salesman for Moorman's Feed and Scholfield Veterinary Supply. He retired in August 2014. Jim was a basketball official for 25 years. Playing softball, waterskiing, playing golf and traveling the US by motorcycle were a few of Jim's favorites. A sports fanatic, Jim was an avid St. Louis Cardinals, Duke, and Rams fan. A favorite pastime of Jim's was watching his grandchildren's activities. Most of all, Jim cherished the time he spent with his family. He was baptized on February 7, 1982 with his wife Sharon on the same day he was called home. Jim was a member of Mission Hill Baptist Church. Memorial contributions may be made to Mission Hill Baptist Church. To send flowers or a remembrance gift to the family of James " Jim" Brumback, please visit our Tribute Store. "Email Address" would like to share the life celebration of James " Jim" Brumback. Click on the "link" to go to share a favorite memory or leave a condolence message for the family.